Many families choose to send their high school age students to outside art classes, but our family has not had the opportunity because of location and the time it would take to drive back and forth to a larger city. I realize now that being a fellow student alongside my boys has made the experience so much the better for all of us. 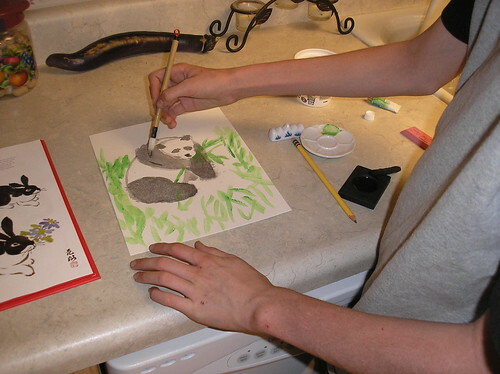 High school level art instruction takes a little planning and some investment of money but the effort can help bring balance and enjoyment to your homeschool week. 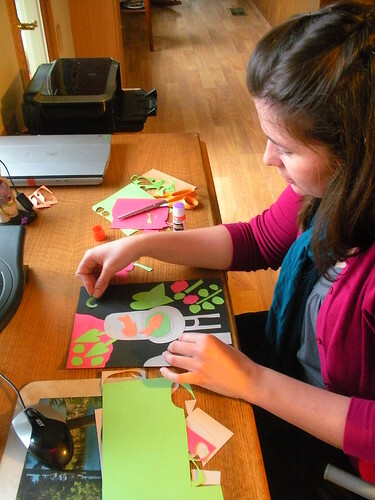 Amanda is working on her Spring Kit for Hearts and Trees. 1. We complete art appreciation (Art History on the transcript) separately from art skills instruction (Studio Art on the transcript). See separate entry: High School Art Appreciation. 2. Some years we focused on acquiring one new skill. 3. Art appreciation and art skills instruction are included each year (few hours a week) and the time is combined into two courses at the end of four years: Studio Art 1 and Studio Art 2. We like having the flexibility to work a little each week and as the boys have matured in their tastes and skills so has their artwork. There is a big difference between the art of a ninth grader and that of a mature twelfth grader. 1. 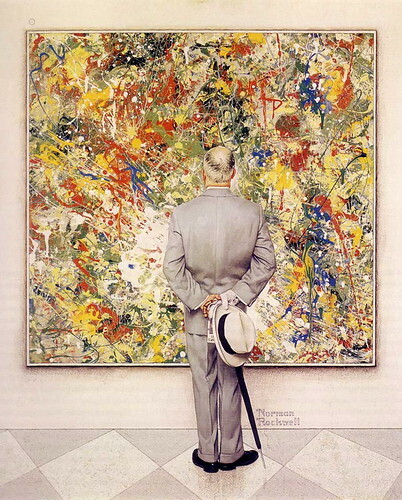 Decide which areas of art you will explore during high school. We have stayed mostly in the visual arts area: painting, drawing, and photography. Mr. A has included applied arts in woodworking and metalworking. Your family might like to explore some other applied arts like weaving, sculpture, graphic arts, jewelry making, or other functional art topics. 2. Find resources to help develop the skills. Try your local library and Amazon.com for books to get you started. Most books will give you an idea of the supplies you will need and then gather your materials. I have found that there is a myriad of YouTube videos that can be helpful as well. My Harmony Fine Arts plans focus more on art appreciation but there is an option for art skills as well. Grade 9 and 10 schedule Artistic Pursuits Senior High Book 1 and Book 2. Grade 11 schedules Drawing in Pen and Ink. Grade 12 is left open for the student to pick an area of study that interests them. Artistic Pursuits is a great solution for many families and if you have a motivated student it can be done independently. Book 1 covers drawing with pencil and charcoal. Book 2 covers watercolors quite thoroughly. 3. Set aside one to two hours each week to focus on art skills, preferably together with your child. It is of value to note that my boys like to see me struggle alongside them as we try to gain a new skill. Most of us have forgotten what it feels like to create art because we felt we were not very good at it in our school days and have long since given up that we were “artistic”. They joy of art is not in the product but in the process…the stroking of the brush, the mixing of colors, the doodling of the pen, the feel of moist clay, the hour or so spent just having fun. Isn’t this what you want your child to experience? If all you are interested in is filling in a transcript or producing a portfolio, you are missing the point. 4. Art at home or in an outside class? There are common arguments for enrolling your child in an outside art class like it is going to make a mess in your home and it is going to be something you don’t feel comfortable teaching. You might feel like you are not skilled enough and you should just enroll your child in an art class. 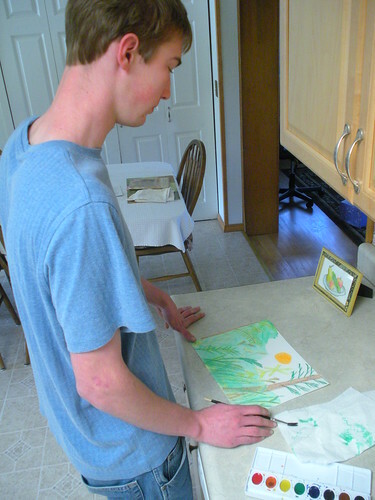 We have overcome every argument and provided basic art instruction in a variety of areas right in our home. Agreed, there is a time to invest in an outside art teacher but it should be after you have introduced a particular medium and your child has shown some interest in putting in the effort to learn more. Set an art budget and use it for quality art supplies or hire a teacher. Working with watercolors in a follow-up Rousseau project. 5. How do you grade art skills? This is a tricky question and my best answer is to decide ahead of time how the grading will work. I detest the idea of giving grades so I had to develop a way to make it as objective as possible. Artistic Pursuits includes an evaluation sheet in their program that I worked into my own system of assigning points/grades to an art skill. The basic idea is to decide if the student completed the art project as assigned, were all the parts completed as outlined in the assignment, and did they accomplish their goal. The goal is not to grade actual skill and ability but rather decide if they met their goals. Oil Pastels: Blend colors to make tints and shades. Watercolors: Compose a picture using warm colors. Value: Use watercolors to paint a simple object and show value. Explore different still-life paintings and then set up your own still-life to draw with colored pencils. Keep an art journal with all your pen drawings. Label and date. on the ARTSEDGE website: Visual Arts Standards Grades 9-12. We spent a complete year working with pen and ink drawing. 6. What do you do with the artwork once it is completed? We keep a 3-ring binder where we can slip 8 1/2 x 11 inch artwork into sheet protectors. The binder also has images of artwork that is too large or bulky to keep. I take photos of larger works like sculptures or collages that we want to include in a portfolio. This binder becomes an on-going record of the chronological study of art from prehistoric to modern. The binder also has dividers for notebook pages, coloring pages, art copywork (in sheet protectors), and end of the unit writing pieces that are done in connection with the art appreciation part of our week. We have a larger portfolio where we store larger works of art when we aren’t displaying them. Here is a link to what we have: Red Wallet Portfolio. Sometimes our art medium and topics corresponded with our history study. 7. The expense of quality art supplies for high school level art courses. How do you decide on supplies if you child wants to pursue something like acrylic painting? I would find a resource either online, from your library, or on Amazon.com. Any book that is going to help you out will include a list of materials to gather. Check your art supply cupboard for any supplies you may already own and have forgotten about because they are stashed away. 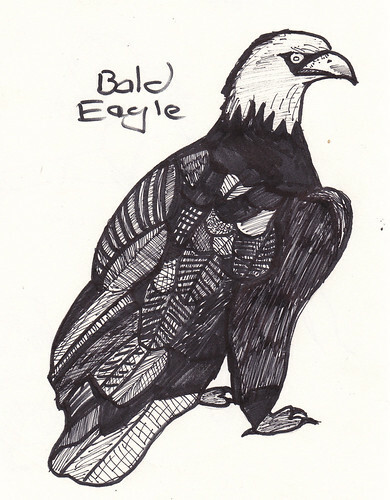 (I found that after homeschooling for a number of years that I had a lot of art supplies on hand that I was not using with my children like brushes, palettes, and pads of paper.) Make a list and check online sources or use coupons from Michael’s or Hobby Lobby to purchase any remaining supplies needed. 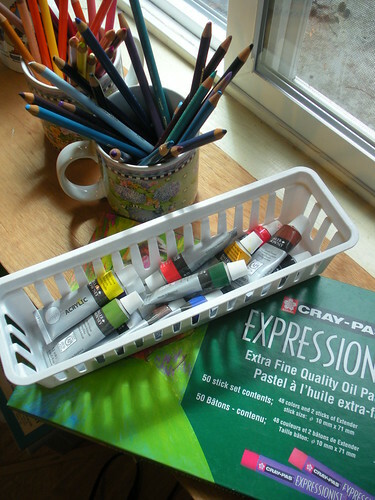 Keep the supplies gathered together and readily available so at your appointed art time they are all ready and waiting. I have a shelf where I keep the term’s art supplies so we do not waste time or need to repurchase supplies because we can’t find them. Using what you have in stock is a great money saver. Art skills instruction at home as part of a complete high school Studio Art course is not only a reachable goal for most families but it is one well worth the effort. If you have have any questions about art instruction, please feel free to email me at any time. You might also be interested in reading: Beyond Picture Study and Creative Atmosphere in Your Home. Barb can I just tell you how much I really enjoy reading your blog. Staring high school in the face (I have a 7th grader this year), I just love all the encouragement that comes our way from your posts. I would also like to add…go Amanda go!! I can’t wait to see that finished kit!! Thanks Tricia for the kind words and you are very welcome for the encouragement. She is really sick right now with the throat/cough bug that everyone has had lately. I talked to her today on the phone and she doesn’t even sound like herself. Poor baby….hard to have sick kids even when they are all grown up. I love all the details you shared of what your do for HS art. I’m going to look more at the resources you have! Thank you so much for sharing this at Trivium Tuesdays! I hope you can share something with us again tomorrow!